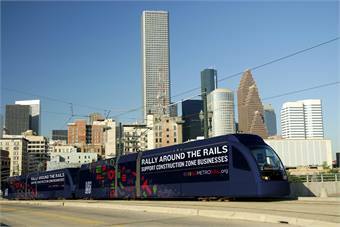 Siemens rail cars, like the one seen here promoting businesses along the new transit corridors, are in service on Houston’s METRORail system and offer fast, reliable transport that will expand with the opening of the new Southeast/Purple Line and the East End/Green Line in 2015. Since 1983, when Houston’s first rail plan was proposed, light rail has come a long way in the city. While the city faced numerous political, legal and financial challenges in the first two decades, forward-thinking leaders persisted knowing that the urban core was getting congested with the rapid increase in the city’s population. In 2001, their efforts were rewarded when the Metropolitan Transit Authority of Harris County (METRO), which serves Houston and the surrounding areas, broke ground on the city’s first light rail line. The successful construction of the 7.5-mile, 16-station Red Line, which ran from the University of Houston-Downtown to south of Reliant Park along the streets of Main, Fannin and San Jacinto, paved the way for more light rail expansion. In 2003, voters approved a referendum to expand Houston’s light-rail system by another 26 miles. Last year, METRO opened the 5.3-mile Red Line extension that heads north. When the first passenger boards the new Purple Line in 2015, Houstonians will add another successful chapter in their growing support for mass transit. Also known as the Southeast Corridor line, the 6.6-mile, 10-station Purple Line begins downtown and travels southeast along Capitol and Rusk to the Palm Center near MLK and Griggs. The line travels through Houston’s Third Ward, one of Houston’s oldest African-American communities, and connects to Texas Southern University and the University of Houston Central Campus. The last portion of the track will enable riders to transfer at the EaDo/Stadium station to travel through the historic East End. Riders can also continue onto Central Station to transfer to the Red Line for travel up or down Main Street. 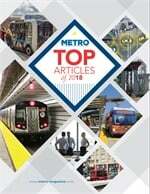 “The Purple Line will accommodate existing and future travel demands in the Southeast Corridor and improve transit services to major activity centers, including the downtown district, major universities, and the Texas Medical Center,” said Jose Enriquez, program manager, Southeast Corridor, METRORail Construction. To successfully complete this project, METRO, in May 2007, commissioned Lockwood, Andrews & Newnam Inc. (LAN), a planning, engineering and program management firm headquartered in Houston, to serve as prime designer under the Houston Rapid Transit (HRT) joint venture contract. Headed by the Parsons Transportation Group, the joint venture team included Granite Construction, Kiewit Texas Construction L.P. and Stacy and Witbeck Inc. 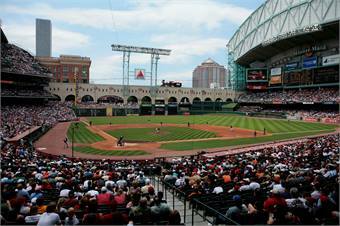 The Purple Line also will make convenient stops at Houston Astro’s Minute Maid Park (pictured), Houston Dynamo’s BBVA Compass Stadium and the University of Houston’s new TDECU football stadium. The project team incorporated a number of distinctive features to enable commuters to have an enjoyable travel experience. Sleek, new light rail vehicles (manufactured by Siemens) powered by an overhead catenary system will quickly transport passengers to work in comfort and style. The trains, which can carry 200 passengers per car, are equipped with eight wide-opening, sliding doors, four on each side of the vehicle. The low floor will enable passengers to board at street level, providing easier access for people of all abilities. The door spacing is optimal for passenger flow — the time necessary to enter and exit the vehicle. The design of the interior maximizes passenger space, using a knee-to-back seating arrangement and a large standing area with extra hand straps and grab bars for passenger safety. In addition to the amplified passenger space and wide doorways, the vehicle is also equipped with two designated wheelchair spaces, allowing priority seating for disabled passengers as well as two bicycle racks, located at front and rear doorways. The 10 stations are contemporary in architectural style, composed of steel beam columns supporting a glass canopy. Each station features customized design through an impressive art program that enhances its appeal to commuters. To capture the essence of the surrounding community through which the Purple Line travels, METRO commissioned a team of local artists to create art for the station’s windscreen glass panels. The murals along the Purple Line feature the powerful contributions of African-Americans to Houston and the state of Texas in a dynamic, historical timeline that unfolds from one station to the next. The Purple Line will provide numerous benefits and opportunities to the Houston community. Thousands of residents will be able to access the Purple Line to commute to work, which will help pull cars off the road, alleviate the congestion on the corridor and save money on gas and parking. Residents will be able to take the Purple Line, and connect to METRO’s vast bus network or other rail lines, to go to businesses, schools, hospitals, restaurants, retail shops, music concerts, arts and other entertainment venues throughout the city. The Purple Line also will make convenient stops at Houston Astro’s Minute Maid Park, Houston Dynamo’s BBVA Compass Stadium and the University of Houston’s new TDECU football stadium. The light rail project will provide fast, dependable service to the University of Houston. Three new stops will serve the University of Houston campus: the corner of Scott and Elgin, on Scott behind the new TDECU football stadium and on Wheeler near Calhoun. Students, faculty and staff from Texas Southern University can also access the Purple Line. Local investments from both private and public entities will help redevelop existing neighborhoods and bring new life to the community. The project has already spurred a number of developments. The Houston Independent School District reconstructed an elementary school to serve the area; a new private K-12 school developed along the corridor; and numerous housing redevelopments, including large apartment and condominium complexes are taking shape in conjunction with the rail corridor improvements. To build the Purple Line, HRT relocated and rebuilt 16 miles of public utilities, 6.6 miles of roadway and more than 11 miles of sidewalks and driveways, significantly improving the infrastructure along the corridor. The project also helped resolve some local flooding issues which had existed in the community for years. As part of the improvements, METRO, working with the City of Houston, upgraded the Columbia Tap Trail, a popular multi-use hike and bike trail in southeast Houston. The upgrades include an irrigation system, sod, plantings and installation of trees to further enhance the trail’s natural setting. Finally, the project will preserve historic properties while providing a critical transportation option. 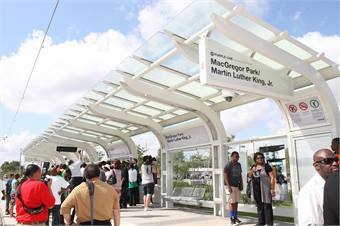 Elected officials, civil rights leaders and residents in May at the unveiling of a bronze statue of Martin Luther King, Jr. METRO worked with the community to make the memorial possible as it designed and constructed the Purple/Southeast Light Rail Line station adjacent to MacGregor Park. The scale and complexity of the project created numerous challenges. The Purple Line lies in a highly used corridor for public and private utilities, including communications, gas, electric, sanitary sewer and water lines. As such, a major component of the project was minimizing the disturbance to the utilities. To achieve this, the design and construction teams collaborated to implement an embedded guideway throughout the alignment. This solution, which reduced the depth of the section, had multiple benefits such as minimizing utility disturbance, decreasing material quantities needed for construction, eliminating costly soil stabilization and providing an all-weather asphalt working surface for the embedded track. The minimized track section saved a significant amount of time and money for the project. Also, the rail alignment lies on or adjacent to the University of Houston property for approximately one mile. Right-of-way negotiations between the university and METRO were lengthy due to the university’s master plan improvements, which included a new football stadium. The project team looked at a number of different options for alignment along the university campus while other construction activities took place. Working closely with the stakeholders, the team reached the best alternative to fit the needs of all parties while re-sequencing work activities to allow for a beneficial solution. The team also addressed clearance issues at the existing I-45 bridge overpass at Scott Street, a high-density intersection. The existing bridge, which was built in the 1950s, had a vertical clearance of 14 feet and 8 inches. With the overhead wire of the light rail vehicle reaching a height of 14 feet and six inches, the clearance underneath the bridge became a pinch point. Also, the columns under the bridges were tightly spaced, which prevented the widening of the street, presenting horizontal clearance issues. Working with METRO, the City of Houston and TxDOT, HRT realigned Scott Street’s existing northbound and U-turn lanes. Crash walls were added between the columns to meet TxDOT and METRO standards. This complex street modification design addressed the vertical and horizontal clearance issues, eliminated the need for a very costly bridge modification or reconstruction, and saved the project significant time in phasing and construction. Introducing a light rail line in a dense corridor also created operational capacity issues. The Purple Line has 22 intersections controlled by traffic signals and 55 intersections without signals. The design team performed a detailed intersection operational analysis using VISSIM to study several modes of transportation including vehicular traffic, existing bus routes and pedestrian movements. The results of this analysis demonstrated that when the Purple Line is constructed, the integrity of the traffic network will be maintained through the year 2035. Another challenge involved choosing a new home for a live oak tree dedicated to Dr. Martin Luther King, Jr., which is now known as the “Tree of Life.” When METRO began planning the Purple Line route down MLK Blvd, the 30-year-old tree was in the middle of the planned MacGregor Park-MLK Station. Working with elected officials, community stakeholders, and METRO staff, the project team helped build a memorial plaza across the street from the station to place the tree. The Purple Line is well on track for a 2015 grand opening. Concurrent with the Purple Line, Houston METRO also will open the 3.3-mile East End/Green Line that travels along Harrisburg from the Magnolia Park Transit Center through the historic East End to a variety of downtown entertainment and business destinations. Combined with the North Line that opened last December, the three new lines will triple light-rail’s footprint in Houston. With these steps, Houston is making great strides, joining the list of cities with top-notch mass transit systems — no small feat for this famously car-centric city.